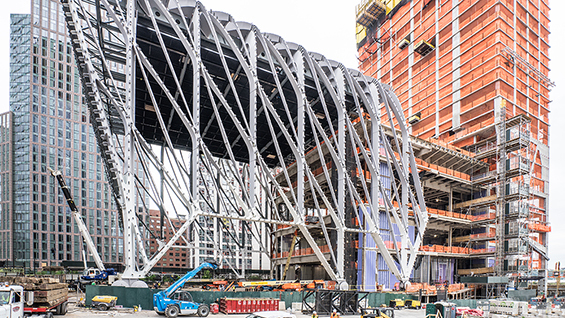 Matthew Ostrow, RA, Barch '09 from Cooper Union and current Senior Associate at DS+R will give a lecture on the Shed, a 200,000sf multi-functional performance and museum space set to open in 2019 at the Hudson Yards. This unique telescoping structure was conceived, planned, designed, and executed through close collaboration with engineers and fabricators. Matthew will discuss the extensive design and execution process that transpired to build this unique moving structure weighing over eight million pounds. Matthew has been an employee at DS+R for 9.5 years, his project credits include the Rio Museum of Sound and Image, Hirshhorn Bubble, Broad Museum, Columbia University Physicians and Surgeons Building, and the Shed. Prior to DS+R Matthew was employed by Grimshaw Architects and Dattner Architects. Matthew is a Visiting Professor at Pratt, and Parsons at The New School. This lecture is open to current Cooper Union students, faculty, and staff. Room 215F.